in the Gouldian finch (Erythrura gouldiae). A decline in wild populations of Gouldian finches has been attributed to a restricted diet and seed shortages during the moult (Dostine et al 2002). Airsac mite infections have also been thought to play a role in the decline of the species (Tidemann & Woinarski 1994). Although reduced availability of critical wet season grass seed resources due to changes in land use and consequent changes in grazing and fire regimes, combined with natural fluctuations in seasonal rainfall is thought to be involved with the decline of the Gouldian Finch in its natural environment, as yet there is no clear link between resource scarcity and its endangered status (Dostine and Franklin 2002; Fraser 2000; Crowley and Garnett 1994). It is possible that S. tracheacolum might have had, and might continue to have, a negative effect on the Gouldian Finch population. It has been speculated that the impact of S. tracheacolum might be exacerbated during periods of physiological stress associated with the moult and food shortages at the onset of the wet season (Lane & Goodfellow 1989 cited in O'Malley 2006a; O'Malley 2006). The moult of the Gouldian finch is known to be more rapid than other co-occurring finches (Franklin et al. 1998) but the manner in which a rapid completion may be achieved through a compressed moult has not been presented. This paper discusses the compressed moult of Gouldian finches, its relationship to airsac mite infection and possible link to its decline in Nature. Gouldian finches are stronger flyers than other co-occurring finches (Long-tailed and Masked Finches) and able to fly long distances in search of food (Tidemann & Woinarski 1994). The annual replacement of flight feathers is therefore critical to their survival. The moult of Gouldian finches is an annual seasonal event with a starting time that may vary slightly depending upon local climatic conditions. The seasons across their tropical range are described as the wet season and dry season, the start and end of which may vary from one year to the next. Gouldian finches (both adults and juveniles) moult during September, October & November (Milton Lewis 2001). Most of the wing flight feathers are replaced during October (Milton Lewis 2001). The moult period finishes in November close to a period when seed shortage can occur (Tidemann & Woinarski 1994). The rapid moult of Gouldian finches appears to be an evolutionary adaptation to an unpredictable climate and tropical woodland breeding environment where there is a need to complete a moult before the end of the dry season (when seed shortages are frequent) and prior to arrival of the wet season (when torrential rains reduce foraging activity and curtail Gouldian finches' ability to fly long distances in search of alternative food supplies). In Nature, the Gouldian finch is more vulnerable to drought during a moult than other co-occurring finch species because it is moulting at a time when seed shortages may occur (Woinarski and Tidemann 1992). A restricted diet and essential lifecycle is believed to render Gouldian finches particularly vulnerable to seed shortages that may occur during their moult (Dostine et al. 2002). Most wild Gouldian finches have completed the wing moult by late October and the body moult by mid December (Milton Lewis, 2001). The early completion of the wing moult appears a significant event. There is a greater energetic cost involved with a rapid moult than a normal moult (Guillemette 2007). Although Gouldian Finches have a more restricted diet compared to other co-occurring granivorous birds (Dostine and Franklin 2002; Fraser 2000; Crowley and Garnett 1994), the seeds of the annual grasses (e.g. Sarga spp.) they seek and available to them for most of the moult period provide a higher quality of nutrient resource than wet season perennial grasses. Captive Gouldian finches carry between nine and ten primary flight feathers. They follow the same rapid moult sequence as for wild populations when provided with ideal housing conditions and good nutrition. The wild population starts the annual moult in September and by late October have completed the wing moult (Milton Lewis, 2001). Under ideal conditions, captive Gouldian finches start to moult their proximal primary remiges in July. The wing moult is complete by the end of October. As with wild birds, there is variation with some individuals taking longer to complete their moult (Milton Lewis, 2001). A normal moult pattern for healthy captive Gouldian finches kept and fed under ideal conditions described below is based upon the author's personal observations as finch breeders rarely examine the flight feathers of their birds. Individuals born at the beginning of the breeding season start to replace their primary flight feathers within a month of fledging. Under ideal conditions the moult of adult birds begins as early as July when the most proximal primary remige is lost. By the first week of August three or four primary flight feathers have been replaced in both adult and juvenile birds. Juveniles bred early in the breeding season start the body moult (i.e. replace their body contour feathers) by the second week of August. Adult birds start to drop body contour feathers during the second half of August. Each primary flight feather is replaced one at a time in an orderly sequence starting from the innermost (proximal) and ending with the outermost (most distal) primary flight feather. The body feathers and secondary flight feathers start to moult when about half the primaries have been replaced. This marks the beginning of the peak period for the moult that continues throughout September and October. Sometimes two adjacent new primary flight feathers may be seen growing simultaneously during the peak period of the moult. The head feathers and last primary flight feathers are the last to be replaced. The moult is concluded during the first weeks of November. Moult abnormalities are most noticeable in captive birds towards the end of the moult. These feather problems occur as a result of inadequate nutrition or poor housing conditions during the period of the moult. Captive Gouldian finches are capable of growing multiple primary remiges simultaneously (R. Marshall personal observations). The goldfinch (Carduelis tristis) shares this ability (Middleton 1977). This moult pattern is known as a compressed moult (Storer & Jehl 1985). The compressed moult of captive Gouldian finches involves the fourth to eighth primary flight feathers with two or more of these feathers being replaced simultaneously. At this time during the peak period of the moult the secondary flights are also being replaced. A compressed intense moult of some seabirds is believed to be an adaptation for exploiting an abundant food source (Storer & Jehl 1985). In Gouldian finches a compressed moult occurs only when plentiful food resources are available as there is a great energetic cost for flight feather growth (Guillemette 2007, Murphy M.E. 1996) with daily energy expenditure increasing up to 20% during the peak period of the moult (Jenni & Winkler 1994). Protein requirements are also increased during the moult as feather mass comprises 20% of total body protein (Murphy, King et al. 1988). A compressed moult should be considered a natural but abnormal event for Gouldian finches. A compressed moult in captive Gouldian finches is prevalent during October following a slow start to the moult. The delay in the start of the moult may occur as a result of poor nutrition, a prolonged cold winter or exposure to cold spells at the beginning the moult period. A compressed moult involves the fourth to eighth remiges in captive Gouldian finches and occurs most commonly during October. Food supply must be plentiful during October if a compressed moult is to occur in wild birds. For wild Gouldian finches the growth of the flight feathers is almost concluded by the end of October (Milton Lewis, 2001), a time when seed resources may be at their lowest level or at times may abruptly decline (Crowley and Garnett 1994). A sudden decline in food quality and availability during a compressed moult will have serious consequences for Gouldian finches. Captive Gouldian finches are most vulnerable when cold spells interrupt a compressed moult involving the simultaneous growth of three or more remiges. A critical reduction in immunity is to be expected when a sudden decline in food availability occurs during the height or at the conclusion of the moult (Franklin et al. 1998). In wild populations of Gouldian finches, it is during these instances of extreme physiological stress that immunity against airsac mites may be overcome (Lane & Goodfellow 1989 cited in O'Malley 2006a; O'Malley 2006). Airsac mite infections are common in captive Gouldian finches in October during the peak period of the moult and following the moult in November and December (Marshall personal observations). In the face of continuous threats from parasites, hosts have evolved an elaborate series of preventative and controlling measures - the immune system - in order to reduce the fitness costs of parasitism (Sheldon B.C. and S. Verhulst 1996). However, these measures do have associated costs (Sheldon B.C. and S. Verhulst 1996). There is a likely symbiotic relationship between Gouldian finches and the Air-sac Mite (Sternostoma tracheacolum), as this endoparasite is present in a high proportion of the wild population (Tidemann et al. 1992c, 1993). Infections are capable of causing respiratory problems that can lead to death (Bell 1996; Tidemann et al. 1992c, 1993). In captive Gouldian finches, Airsac mite infection is a common cause of illness and death. Airsac mite infection is a rare event when adequate nutrition is provided during a normal moult i.e. when remiges are being replaced one at a time. However, airsac mite infections are common in captive birds when a compressed moult is interrupted by adverse weather conditions, even when the diet is nutritionally fortified (Marshall personal observations). Disease caused by a sudden increase in gravid female numbers is controlled by conditions that maintain a healthy immune system. Non-gravid female mites residing in the posterior airsacs being protected from any immune response remain a potential source of rapid re-infestation should immunosuppression occur. When immunity is compromised a rapid increase in gravid females may occur because unfertilised eggs in the lungs are capable of arrhenotokous parthogenesis (i.e. unfertilised eggs capable of developing into haploid males) and proportionally more male mites persist in the lungs with small infra-populations (Experimental and Applied Acarology 1996). Gravid females tend to occupy the airsacs, syrinx and trachea and move to the lungs to lay their eggs. The eggs quickly hatch with the nymphs and sub-adults feeding off the blood rich pulmonary tissue. Adult males remain mostly in the lungs. The life cycle may be completed within 6 days (P.J.Bell 1996). In Nature the moult of the flight feathers of the Gouldian finch must be rapid in order to be completed before the onset of the wet season when food availability is usually low or may abruptly decline. I believe a compressed moult is possible in wild birds although its presence has not been previously recorded. When the progress of the moult is delayed or interrupted by inadequate food resources or cold temperatures, a compressed moult may occur if food supply is restored by the peak period of the moult, which occurs in October. A compressed moult in Gouldian finches occurs during the peak moult period. In Nature the peak period for their moult has evolved around the time (October) when food supply is plentiful. The degree of nutritional abundance is controlled by the amount of seeds produced by perennial grasses (e.g. sorghum species) that grow as a result of rains during the previous wet season and seeds from annual and perennial grasses that germinate in response to the increasing temperatures of September and rainfall in October. A compressed moult becomes possible in wild birds when the moult is interrupted or delayed by cold September temperatures followed by warm weather and premature wet season rains that provide a good food supply during the peak period of the moult in October. Gouldian finches, especially the juveniles are thought to become vulnerable at the closing stages of the moult when the nutritional resources needed to support the moult are lacking. In Nature, Gouldian finches are most vulnerable at the end of the moult period when food resources are low or abruptly decline at this time. The high prevalence of Airsac mite infection seen in captive Gouldian finches at this time supports the view that airsac mite infections are a result of a depressed immune response. The immune response appears to decline during a compressed moult as there is an increased incidence of Airsac mite infection in captive finches when a compressed moult is suddenly interrupted by cold weather. Catastrophic losses are possible as a result of infection because Airsac mite numbers can rapidly explode when the immune response is severely compromised. Losses are likely to occur as a result of Airsac mite infection at the conclusion of the moult in November and when a compressed moult is interrupted by a sudden decline in available food resources towards the end of October. It may be possible that the sudden decline in numbers during the 1970's may be attributed to conditions that interrupted a compressed moult. A failure of these numbers to rebound to previous high levels following this episode(s) may be associated with habitat destruction by pigs, fire, mining and agriculture that has affected food supply towards the end of the dry season. Further scientific research is needed to confirm the existence of a compressed moult in Nature and its link to Airsac mite infections in wild populations. Barnard, H.G. (1914). Northern Territory birds. Emu. 14:39-57. Bell, P.J (1996). Survey of the nasal mite fauna (Rhinonyssidae and Kytoditidae) of the Gouldian Finch, Erythrura gouldiae, and some co-occurring birds in the Northern Territory. Wildlife Research. 23:675--685. Berney, F.L. (1903). North Queensland notes on some migratory birds. Emu. 2:210--211. Birchenough, A.C., G.W. Douglas & S.M. Evans (2002). The status of estrildid finches in north-western Australia. Australian Bird Watcher. 19:147-160. Burton, C.T. & W.W. Weathers (2003). Energetics and thermoregulation of the Gouldian Finch (Erythrura gouldiae). Emu. 103:1-10. Crowley, G.M. & S.T. Garnett (2001a). Growth, seed production and effect of defoliation in an early flowering perennial grass, Alloteropsis semialata (Poaceae), on Cape York Peninsula. Australian Journal of Botany. 49:735-743. Donato, D. (1996). A Survey to Locate Gouldian Finch Populations; the Pine Creek Region Northern Territory. Dostine, P. (1998) Gouldian Finch Recovery Plan Erythrura gouldiae Parks and Wildlife Commission NT and Environment Australia, Darwin. Dostine, P.L. & D.C. Franklin (2002). A comparison of the diet of three finch species in the Yinberrie Hills area, Emu. 102:159-164. Dostine, P.L., (2001). Seasonal use of savanna landscapes by the Gouldian Finch, Erythrura gouldiae, in the Yinberrie Hills area, Northern Territory. Wildlife Research. 28:445-458. Evans, S.M. & A.R. Bougher (1987). The abundance of Estrildid finches at waterholes in the Kimberley (WA). Emu. 87:124--127. Evans, S.M. & M.E. Fidler (1986). The Gouldian Finch. United Kingdom, Blandford Press, Poole. Evans, S.M., J.A. Collins, R. Evans & S. Miller (1985). Patterns of drinking behaviour of some Australian estrildine finches. Ibis. 127:348-354. Evans, S.M., R. Neems & C. Pagendam (1989). Drinking skills in estrildid finches. Emu. 89:177-181. Franklin, D.C. (1999a). Evidence of disarray amongst granivorous bird assemblages in the savannas of northern Australia, a region of sparse human settlement. Biological Conservation. 90:53-68. Franklin, D.C. & P.L. Dostine (2000). A note on the frequency and genetics of head colour morphs in the Gouldian Finch. Emu. 100:236-239. Franklin, D.C., A.H. Burbidge & P.L. Dostine (1999). The harvest of wild birds for aviculture: an historical perspective on finch trapping in the Kimberley with special emphasis on the Gouldian Finch. Australian Zoologist. 31:92-109. Franklin, D.C., P.J. Whitehead, G. Pardon, J. Matthews, P. McMahon & D. McIntyre (2005). Geographic patterns and correlates of the decline of granivorous birds in northern Australia. Wildlife Research. 32:399-408. Franklin, D.C., P.L. Dostine & S.C. Tidemann (1998). Post-juvenile mount strategies of co-existing Gouldian, Long-tailed and Masked Finches. Corella. 22:73-79. Fraser, F.J. (2001). The impacts of fire and grazing on the Partridge Pigeon: the ecological requirements of a declining tropical granivore. Ph.D. Thesis. Aust. National University, Canberra. Garnett, S. & G. Crowley (1994). Wet-season feeding by four species of granivorous birds in the Northern Territory. Australian Bird Watcher. 15:306-309. Garnett, S.T. & G.M. Crowley (1995a). Feeding ecology of Hooded Parrots Psephotus dissimilis during early wet season. Emu. 95:54-61. Garnett, S.T. & G.M. Crowley (2002). Recovery Plan for the Golden-shouldered Parrot Psephotus chrysopterygius 2003-2007. Queensland Parks and Wildlife Service, Brisbane. Holmes, G. (1995a). Survey of Gouldian Finch in Queensland During Dry Season of 1995 - With Review of Distribution and Status. Unpublished report to Conservation Commission of the Northern Territory, Darwin. Holt P.S. (1992). Effects of induced molting on immune responses of hens. Br Poult Sci 33:165–175. Koertz, A.H. (2003). The Factors Influencing Reintroduction Success of the Endangered Gouldian Finch. Hons. Thesis. Honours thesis, School of Tropical Biology, James Cook University. Martin L.B. (2005). Trade-offs between molt and immune activity in two populations of house sparrows (Passer domesticus). Can J Zool 83:780–787. Martin L.B., A. Scheuerlein, and M. Wikelski. 2003. Immune activity elevates energy expenditure of house sparrows: a link between direct and indirect costs? Proc R Soc Lond B 270:153–158. Murphy M.E. (1996). Energetics and nutrition of molt. Pp. 158–198 in C. Carey, ed. Avian Energetics and Nutritional Ecology. Chapman & Hall, New York. Murphy M.E. (1988). Canadian Journal of Zoology, Vol. 66, pp1403-1413. Nordling D., M. Andersson, S. Zohari, and L. Gustafsson. (1998). Reproductive effort reduces specific immune response and parasite resistance. Proc R Soc Lond B 265:1291–1298. Norris K. and M.R. Evans. (2000). Ecological immunology: life history trade-offs and immune defense in birds. Behav Ecol 11:19–26. O'Malley, C. (2006a). Appendix to the National Recovery Plan for the Gouldian Finch (Erythrura gouldiae) Background Information. [Online]. Palmer, C. (2005). Review of Radio Tracking Data From the Gouldian Finch Erythrura gouldiae Project - Yinberrie Hills Study Site December 1999 to August 2000. Palmer, C. & J. Woinarski (2006). Threatened Species Information Sheet: Gouldian Finch Erythrura gouldiae. Poiani A., A.R. Goldsmith, and M.R. Evans. (2000). Ectoparasites of house sparrows (Passer domesticus): an experimental test of the immunocompetence handicap hypothesis and a new model. Behav Ecol Sociobiol 47:230–242. Schmid-Hempel P. and D. Ebert. (2003). On the evolutionary ecology of specific immune defence. Trends Ecol Evol 18:27–32. Sheldon B.C. and S. Verhulst. (1996). Ecological immunology: costly parasite defences and trade-offs in evolutionary ecology. Trends Ecol Evol 11:317–321. Svensson E., L. Ra°berg, C. Koch, and D. Hasselquist. (1998). Energetic stress, immunosuppression, and the cost of an antibody response. Funct Ecol 12:912–919. Tidemann, S.C. (1987). Gouldian Finches in the wild. Bird Keeping in Australia. 30:145-153. Tidemann, S.C. (1991). Notes on breeding behaviour of the Gouldian Finch Erythrura gouldiae in the wild. Australian Aviculture. 45:157-158. Tidemann, S.C. (1993a). Where are Gouldian Finches after the breeding season?. Victorian Naturalist. 110:238-243. Tidemann, S.C. (1993b). 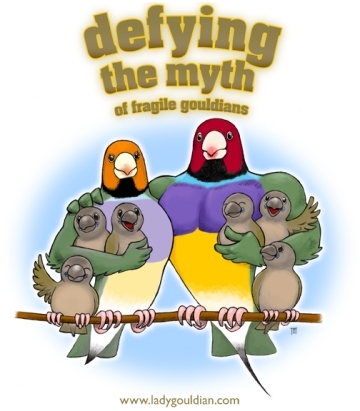 Management of a threatened species - the Gouldian Finch example. In: Catterall, C.P., P.V. Driscoll, K. Hulsman, D. Muir, & A. Taplin, eds. Birds and Their Habitats: Status and Conservation in Queensland. Page(s) 123-131. Queensland Ornithological Society, St Lucia, Queensland. Tidemann, S.C. (1996). Causes of the decline of the Gouldian Finch Erythrura gouldiae. Biological Conservation International. 6:49--61. Tidemann, S.C. & J.C.Z. Woinarski (1994). Moult characteristics and breeding seasons of Gouldian Erythrura gouldiae, Masked Poephila personata and Long-tailed Finches P. acuticauda in savannah woodland in the Northern Territory. Emu. 94:46--52. Tidemann, S.C., C. Lawson, R. Elvish, J. Boyden & J. Elvish (1999). Breeding biology of the Gouldian Finch Erythrura gouldiae, an endangered finch of northern Australia. Emu. 99:191--199. Tidemann, S.C., C. Palmer, J. Boyden & T. Hunt (1992d). Predation on Gouldian Finch Erythrura gouldiae by reptiles. Corella. 16:105-106. Tidemann, S.C., J. Boyden, R. Elvish, J. Elvish & B. O'Gorman (1992a). Comparison of the breeding sites and habitat of two hole-nesting estrildid finches, one endangered, in northern Australia. Journal of Tropical Ecology. 8:373-388. Tidemann, S.C., J. McCartney & I. Smith (1993). Queensland Gouldian Finches Erythrura gouldiae and air-sac mite Sternostoma tracheacolum. Sunbird. 23:36-40. Tidemann, S.C., M. Calley & C. Burgoyne (1992b). An investigation of blood smears of northern Australian finches. Emu. 92:114-117. Tidemann, S.C., S. McOrist, J.C.Z. Woinarski & W.J. Freeland (1992c). Parasitism of wild Gouldian Finches (Erythrura gouldiae) by the airsac mite Sternostoma tracheacolum. Journal of Wildlife Diseases. 28:80-84. Woinarski, J.C.Z. & S.C. Tidemann (1991). The bird fauna of a deciduous woodland in the wet-dry tropics of northern Australia. Wildlife Research. 18:479--500. Woinarski, J.C.Z. & S.C. Tidemann (1992). Survivorship and some population parameters for the endangered Gouldian Finch Erythrura gouldiae and two other finch species at two sites in tropical Northern Australia. Emu. 92:33--38. Zapopan NL and NSR Environmental Consultants, Curtin University of Technology, Bentley, Western Australia.